My Brotherhood crew's ranks grow again - finally! 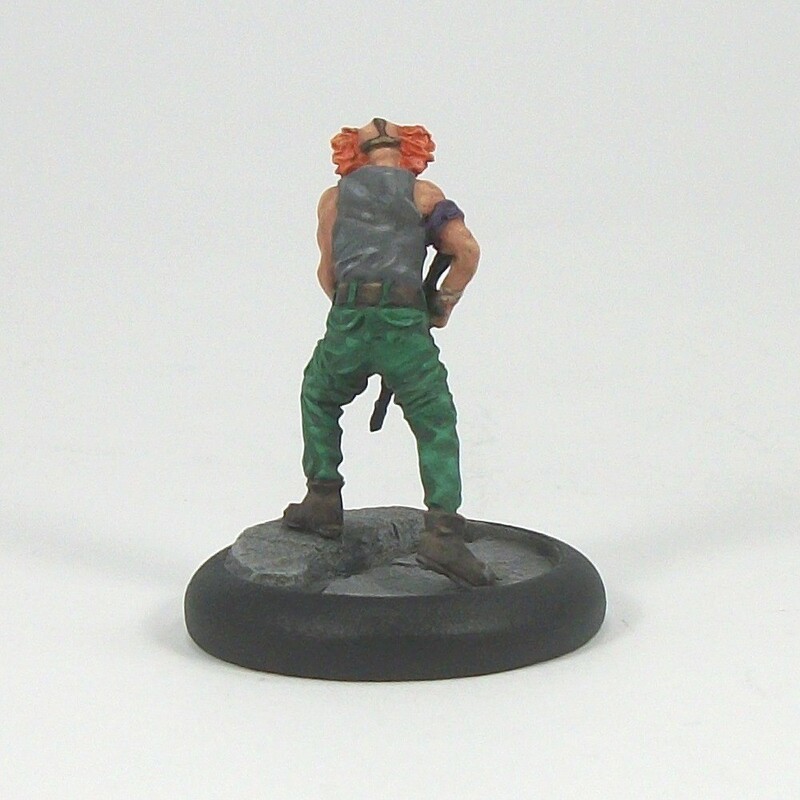 I have finished Bonaccia some 18 months or so on from my last Freebooter's Fate mini (Trucco). I started Bonaccia a long time ago, some time in 2015, possibly even earlier. But I just kept putting her to one side, and not finishing her. Recently I was determined to rectify that, and so she is now finished, even if not my favourite paint-job in the crew (I think partly due to the colour scheme I selected). That said, being 'done' is the most important thing, so another mini is chalked off. As another Specialist, the nearest comparison I have so far to Bonaccia is Apagado. Bonaccia costs 5 doubloons more, for which Apagado has a slightly stronger left-hand attack and slightly more vitality, while Bonaccia gains Blade Mistress, adding +1 Attack which is very good! I am sure Rob won't be looking forward to facing her with his Pirates! Then again he will probably shoot her as much as he can after recent experience. Bonaccia takes my crew to a total of 495 doubloons. I can take one more Specialist and still make a game-legal crew (the Brotherhood may take up to two Specialist per Deckhand, and I have two of the latter), so I will need to have a think about what I paint next for the game. 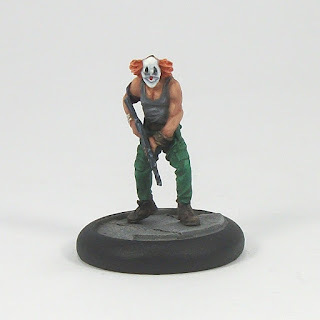 I am tempted to paint another Brotherhood Specialist, but I could opt for my first Mercenary instead. I hope Bonaccia gets a run out on the gaming table soon, especially as I have recently acquired a cool-looking gaming mat for our games. Catwoman (in the Batman Animated style, after Batman in January) is my 44th BMG mini I have painted. This was a 'quick and done' paint-job because my painting momentum has recently dissipated. I decided I was going to get her finished today, having previously applied the main grey colour only as a consequence of painting something else, then painting the belt, then putting her to one side for a few weeks. Overall I am happy with the simple paint scheme and results, and it is nice to have another mini 'done' this year and especially this month. Hopefully this kick-starts me into finishing a few more minis from different ranges and games this month. I think Knight Models did a good job translating two-dimensional cel animation into a three dimensional sculpt. The model is a single piece which is a nice change for this range, and the only real hassle was needing to trim the slotta tab to fit a channel I widened in the base (this is because I want all my painted BMG minis to have the same base style - Fraktured from Dragon Forge Designs, and this sculpt has her whip trailing along the slotta tab). I don't really foresee using this version of Catwoman in many games, basically as for me she does not stack up well enough as an alternative to the Arkham City Catwoman. The main reasons for that are lack of extra VP scoring; Endurance 4 which makes her vulnerable to attacks doing 2 damage; and Willpower 5, making her available counters for Dodges and move and Defense more limited. That aside, I really do like the mini as I am a big fan of Batman the Animated Series and related shows. When I eventually have a few more Animated-style minis done I will do a group shot of them together.